OT and wound care is often only skimmed in occupational therapy education. This is unfortunate because OTs offer a unique perspective on wound care. OTs have a keen understanding of how a wound will affect a patient, as we excel at understanding our patients' individual needs, limitations, and adaptabilities. Furthermore, OTs have knowledge of the adaptive equipment and techniques that allow our patients to be as independent and functional as possible. This applies to wound management as well. 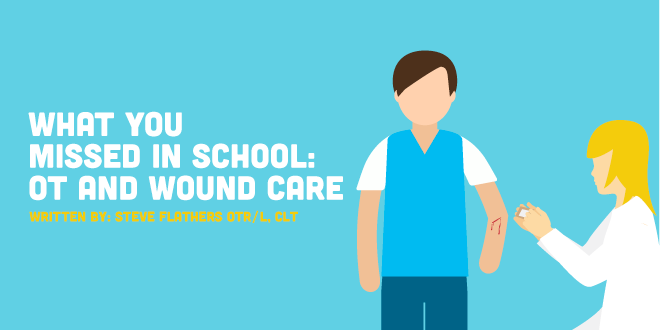 Wound care is not just placing the right wound dressing. It often requires the patient to take an active role in their therapy. This includes cleaning and redressing wounds, possibly applying dressing themselves, managing wound care devices that may have been applied, elevating limbs appropriately and donning/doffing compression and protective garments. As we know, it can be very difficult for a patient with injuries, disabilities, or age-related limitations to effectively care for a wound on their own. Not to mention, independently donning compression garments can be a very difficult process. Fortunately, OTs are experts at teaching clothing donning/doffing techniques as well as appropriate assistive device management. Many times a patient may have a chronic wound that just won’t heal, and the missing factor is appropriate compression. However, that patient may live alone and not be able to don a compression garment. This is where OTs really stand out. Many times, finding a way for a patient to simply acquire an appropriate compression garment can make all the difference with a non-healing wound. Also, managing drainage and elevation may require adaptive techniques. Additionally, it may take some family training, if available. All of these reasons help us realize just one more of the many roles OTs can adopt in patient care, especially nontraditional areas like wound care.